The FIBA Asia Basketball Championship scheduled to be held at Dhaka in Bangladesh. The dates of this championship are yet to be announced. In a hard-fought final, Bengal Tigers overcame Punjab's team Ludhiana Steelers 22-17 in the men's final of the FIBA 3x3 Quest - India Qualifiers and the Bengal Tigers team awarded with a cheque of 75,000 and Runners Up team Ludhiana Steelers are awarded 50,000. Ludhiana men’s outfit with Sunil Bajaj, Gurbhaj Singh, Richu Sharma and Kamal Gurbhaj Singh in its ranks- Ludhiana Steelers, however, waged a spirited battle against West Bengal before going down 17-21 but nevertheless, they too assured themselves a ticket to the championship slated to be held in Dhaka as the finalists qualify for this competition. In the women’s section, Ludhiana Sparx comprising Kiranjot Kaur Dhaliwal, Shabnam, Amandeep Kaur and Poonam emerged champions in the qualifiers at Bengaluru. In the final, they outclassed Tamil Nadu 16-10 to book their berth for the FIBA Asia Championship. Four teams Ludhiana Steelers and Bengal Tigers in Men's section and Ludhiana Sparx and Tamil Nadu Tigers in Women's section will represent India in South Asian Basketball (SABA) 3x3 Quest. 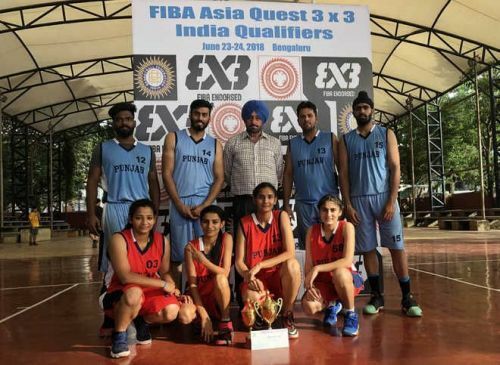 But Ludhiana Cagers qualified for this championship on the basis of their performance during the FIBA Asia Quest 3x3 India Qualifiers held on June 23 and 24 at Bengaluru. Rajdeep Singh Gill and Teja Singh Dhaliwal, president and general secretary of the Punjab Basketball Association, respectively, along with other office-bearers and those of the Ludhiana District Basketball Association congratulated the players on this achievement. They also appreciated their coach Davinder Pal Singh Dhindsa for guiding them to bring fame to the city and state.